Fallow deer are on of the popular exotic species raised in North America. Their domesticated history extends back to the 9th century B.C., when the Phoenicians domesticated them for quality venison. For centuries, the Europeans raised them for food, and today fallow deer continue to yield fine table venison. Their recent farming history can be traced to German farmers who sought an alternative and more profitable land use. Josef Kerckerinck, NADeFA's founder, was the first to farm fallow deer commercially for venison in North America. He established his farm in New York in 1979, and fallow deer farming quickly spread throughout the Northeast, and today all throughout North America. 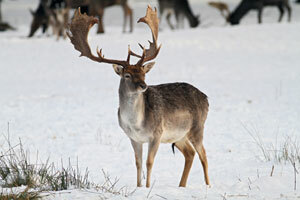 The most distinctive feature of the fallow deer is the male's antlers. Broad, flat, palmated antlers grace each buck's head. They resemble a hand with widespread fingers pointing backwards. The coloring of fallow deer varies between white and black, following four main patterns: white, menil (a light brown coat with bright white spots), common or ginger (rich brown with white speckles on their back and flanks, and a black stripe), and black. Fallow deer are comprised of two subspecies: Mesopotamian and European. The most obvious differences between the two are body size and antler shape. The Mesopotamian fallow deer are larger than their European companions, and their antlers spread out at the base, while the European fallow have their palmation near the top. Fallow deer harbor a natural resistance to disease and parasites, including yersiniosis, lung worm, and chronic wasting disease. They also are not very susceptible to copper deficiency. It is nonetheless very important to check the health status and the history of the deer before they are bought. Efficient converters of forage to meat, fallow deer are grazers consuming an unusually wide range of grasses, legumes, and broadleaf weeds. They thrive on any pasture that would support cattle, sheep, goats, horses, antelope, and camelids. In New Zealand it is not unusual to see fallow deer grazing among other species as a means of weed control. Fallow deer follow the patterns of their cervid counterparts in reproduction stages; however they do not cross with any other specie and they rarely birth twins. Fallow deer have seasonal synchronization of birth, body growth, activity cycles and growth stasis corresponding to feed quantity, quality and availability. For example, maximum nutritional demands for females occurs during lactation. Gestation for fallow deer averages 234 days plus or minus 6 days. The precise timing of breeding and birthing ensures that maximal lactational demands coincide with the most lush and plentiful growth of forage (May, June, and July in the northern hemisphere). The summer is the time for fawning and lactation, and the time of maximum weight gain for yearlings. For mature bucks, it is the time for antler growth and regaining of body condition and fat reserves which were depleted during the previous autumn rut and winter. The ratio of breading bucks to does should conservatively be one to twenty. On the average, does fawns until they are about fifteen years old. With fallow deer the common European sub-species is often crossed with the larger Mesopotamian fallow deer and pheno-menal increases in growth rates result. Through the use of Mesopotamian bucks, the deer farmer can market his slaughter bucks earlier than the 15-24 month average of pure European fallow deer. Fallow deer herd structure determines their social organization: adult does, yearlings and fawns make up one herd, while adult buck form smaller herds.